Group Meetings Help Latina Women Reduce Their Risk Of Diabetes : Shots - Health News La Comunidad, a grassroots effort in Winston-Salem, N.C., offers treatment to a population at high risk of developing diabetes. Group meetings led by non-medical facilitators help reduce costs. 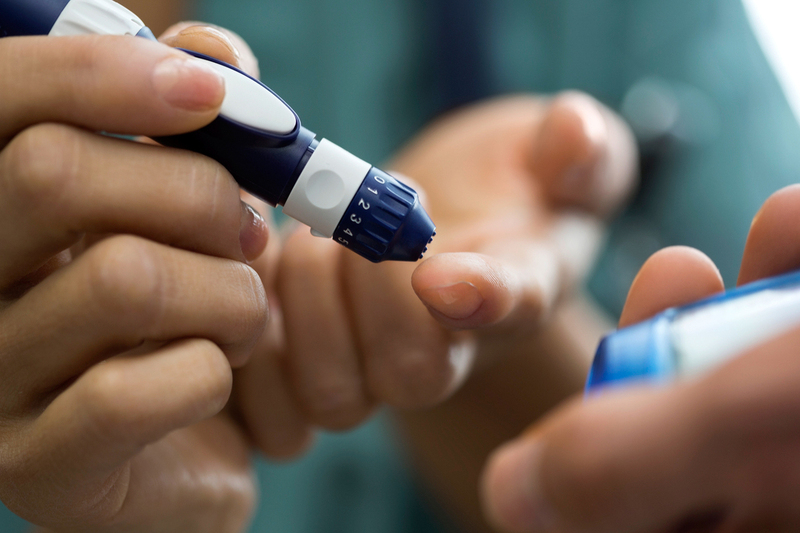 The goal is to intervene early so that fewer Latino women develop Type 2 diabetes. Beatrice Sanchez and Mariana Arias drive around their city, Winston-Salem, N.C., in search of a very specific population of residents: Latinos with prediabetes. The two women, both bilingual and Hispanic, are recruiting participants for a Type 2 diabetes prevention study called "La Comunidad," a lower-cost local version of the landmark Diabetes Prevention Program trial that staved off diabetes through changes in diet and physical activity in about 50 percent of study participants. The results of that study suggested it was possible to fight a disease that affects about 29 million Americans without drugs and their side effects. It was more effective than using a common diabetes drug called metformin, which cut that number by just 30 percent. The Diabetes Prevention Program is "still the gold standard," says Mara Vitolins, an epidemiologist at Wake Forest University Medical Center in Winston-Salem who is leading La Comunidad. When the results of the Diabetes Prevention Program were first published, Vitolins was eager to test this concept in her own city, but cost was a big challenge. The program required six months of one-on-one counseling with case managers trained in nutrition or fitness, followed by personal visits every month for another year and a half. The first two years of intervention amounted to more than $2,600 per person. To reduce the cost, Vitolins decided to focus on a part of the earlier program that relied on group counseling for her two-year study, called Healthy Partnerships in Preventing Diabetes (HELP). "The whole idea was to take something that was extremely expensive and find every way that we could to make it more community friendly and that it can be sustained," she says. HELP replaced case managers with community health workers and group meetings to help participants lose weight and bring their blood sugar levels down. It worked. The two-year study, which was completed in 2011, met goals close to or the same as those reached by the DPP for about a third of the cost—$850 per person. But the study was small, with only 301 participants, so it was impossible to tell if it lowered participants' risk of developing diabetes. And the HELP study had another shortcoming. Though it was designed to reach a high-risk, underserved population, it included very few Latinos, a group that makes up about 15 percent of Winston-Salem residents. Latinos are more susceptible to developing diabetes at a young age; according to CDC data from 2011, the average age for diabetes diagnosis among whites was 55, but 49 for Hispanics. To reach the Latino population, Vitolins launched La Comunidad in 2014, translating the HELP program materials into Spanish. But she knew she needed to do more than just change the language. So she hired Arias and Sanchez as recruiters and ambassadors to the city's Latino population, which includes undocumented immigrants. "We've got to establish communication," says Sanchez. "We're targeting a group of people that are very cautious." The team determines whether the participants' blood-glucose levels are high enough to be classified as prediabetic. Some are turned away because they are pregnant or unknowingly already have full-blown diabetes. Pregnancy was not an issue in Vitolins' former study because the average HELP participant was 60 years old, says Vitolins. But most of the people joining La Comunidad are in their early 40s. "We're finding that the Latino community, especially the women, are qualifying at a younger age." The project team is also finding that more Latino women than men qualify for the program. They speculate that Latino men may have more physically active lifestyles, keeping them from developing prediabetes. After qualifying, La Comunidad participants meet with a registered dietician. They also visit an outpatient clinic for general health assessments and blood work every six months for two years. The first recruits finished in May. But the bulk of the work happens during group meetings, which are held weekly for the first 24 weeks. After that, members gather once every other month for the rest of the study. Topics cover everything from basic nutrition to what kind of shoe is best for particular workouts. Group members share their own advice and experiences. One woman could not afford to buy prepared food, says Carmen Vazquez, a health adviser who helps lead the group meetings. Despite limited resources, she still manages to eat healthy and exercise. So far, she's lost 40 pounds. "She has been an example to the rest," Vazquez says. The meetings help participants become aware of how foods and activities affect their bodies. "One of the major emphases of the program is to be sure people take control of their own life," says Vazquez. Information may have been missed because of health disparities, language barriers or just lack of education, and "We are trying to fill that gap." Vazquez is quick to point out that she and the other health advisers are laypeople — in fact, her background is in fashion. Vitolins says this is one of the keys to making the program affordable. "It didn't matter that the person leading it didn't have a high school degree. It's the fact that that person can communicate a message." The ultimate goal of studies like La Comunidad, Vitolins says, is to determine whether group-based techniques are helpful from both a health and medical reimbursement perspective. In March, the Centers for Medicare and Medicaid Services (CMS) announced that Medicare would cover preventive programs that meet the Centers for Disease Control and Prevention's (CDC) requirements, such as data reporting. Vitolins agrees that community-level programs must have good data to support their use. "We're testing before we say everyone who's in the Latino population should use this approach," she says. "We want it to be effective." Not everyone shares Vitolins' enthusiasm. Richard Kahn, a professor of medicine at the University of North Carolina at Chapel Hill says it's too early for Medicare and health insurance companies to be covering such programs, since they delay diabetes rather than prevent it totally. "The question which is unanswered is whether that delay actually makes a difference," Kahn says. Another question is whether weight loss in the first few years of a program makes a difference if participants just gain it back, which many do. "We need more studies about how the body regulates weight." In the meantime, Vitolins focuses on getting the message of diabetes prevention out to people who may not know their risk. Estimates vary depending on how blood glucose is measured, but the CDC reports that 86 million Americans are prediabetic, and many don't know it. "With the numbers that we think are out there, every single program that shows efficacy should be at the table," Vitolins says. Amanda B. Keener is a freelance science journalist who writes for Nature, The Scientist and PBS.org.